← No, Hansen wasn’t wrong! I’m on the train back from a meeting in Leicester, so have a bit of free time to write a post. I thought I might write about something a bit different to my normal posts. My father contacted me a few days ago to highlight that the Sri Lankan navy have just raised the wreck of a ship sunk during World War II. The ship was the S S Sagaing and it sank on the 9th of April 1942 while at anchor in Trincomalee harbour after being bombed by the Japanese. The reason for my interest is that my grandfather, Kenneth Macleod, was the second mate at the time. After abandoning ship, a suitcase floated past their lifeboat. 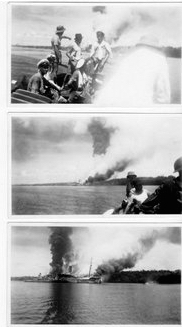 After recovering it they discovered a camera and took the photographs on the right, showing the ship burning in the background. This wasn’t the first time that my grandfather was on a ship that sank. He was also the third mate on the Kemmendine which was sunk by the German auxiliary cruiser Atlantis on the 13th of July 1940. The passengers and crew were picked up by the Atlantis and then transferred to other ships. My grandfather ended up on a Yugoslavian ship called the Durmitor which grounded near Mogadishu, Somalia. The prisoners ended up in an Italian prisoner of war camp just south of Mogadishu. They were liberated in February 1941 by South African soldiers. The Royal Navy then asked them to crew some captured merhant ships back to the United Kingdom. I believe that my grandfather was one who did so, although he may have crewed one from Durban, rather than from Somalia (I shall have to check with my Mother). Less than a year later he’d signed on to the S S Sagaing, which a couple of months later was bombed and sank in Trincomalee harbour. I think I managed to find the wreck on Google Maps. As mentioned in some of the reports, it was moved after being bombed and then sunk again to be used as a pier. 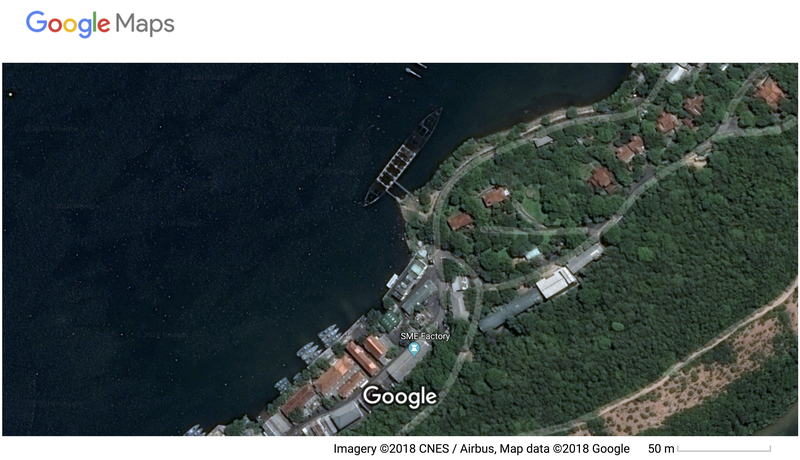 If you compare the Google maps image with the image on the bottom left (from this article) you can see the red roofs of the buildings and also what look like some naval ships that are also in the lower corner of the Google maps satellite image. I’ve also included a larger satellite image showing where it is in Trincamolee harbour (or, used to be). This entry was posted in Personal and tagged Atlantis, Captain Kenneth Macleod, Kemmendine, S S Sagaing, Sri Lanka, Trincomalee, World War II. Bookmark the permalink. He was lucky to survive two sinkings resulting from bombardment. It must have been terrifying. I am inexpressibly grateful to have grown up without being conscripted to fight in a war. I hope the same is true for my son. Interesting history and amazing photographs. I have done extensive research on my father’s WW2 service, including interviewing a few dozen survivors, old men when I found them, of the various units in which he served. When they had scrapbooks, I always scanned them. I have a couple hundred Pacific War photographs, many of them unpublished. Each man had an amazing story. This is an Official United States Marine Corps photograph. It’s my father holding a pump shotgun. They were issued to the line aid station in case the corpsmen had to defend the wounded from an enemy attack. 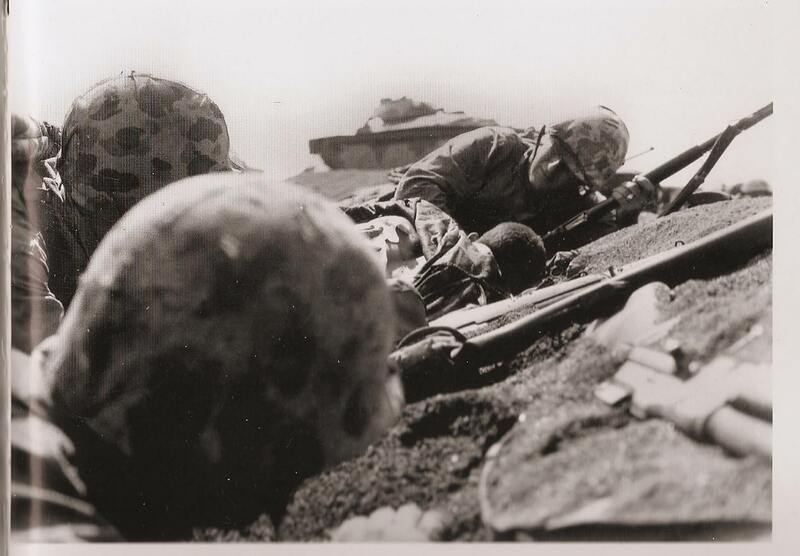 In the photo he has just plopped down to render aid to a marine who was shot in the chest early in the morning on D-Day, Green Beach, Iwo Jima. It was one of the bloodiest battles of the Pacific War. Yes, likewise. I often wonder if we’re now living in an age in which people have forgotten the sacrifices made to protect our liberties and fight off facism. Amazing photograph. Also amazing what some people have had to go through. I lived in Caen, France for six months many years ago. During that time, I toured all the 1944 D-Day beaches, including many of the cemeteries. It was astonishing and sobering to see how many young men died in such a short period – and the number buried in Normandy was only a small fraction of the total. In the one major German cemetery, there are two graves for each headstone. Many of the headstones said either “Ein Deutscher Soldat” or “Zwei Deutche Soldaten”. Nobody even knew who they were burying. Family who lost loved ones would never know exactly how they died or where they were buried. My father waded off a landing craft in Normandy in July, 1944. If it had been June, I quite possibly wouldn’t be here. He never liked to talk about most of what he saw in Normandy that summer. He’d talk about the camaraderie in England prior to the invasion, but not about what he saw after. Not unless he’d had an awful lot to drink. My father joined the US army air force was a gunner on a B-17 and he was credited with shooting down 2 or 3 enemy planes. His plane was shot down and he was injured (pitch forked by a german farmer) and spent the rest of the war in Stalag 17. All this trauma left permanent scars that left him a bitter man. War… what’s it good for… nothin! War… what’s it good for… nothin! Indeed. It’s hard to see how people can come out of these experiences without being scarred in some way. Many of the German soldiers in the beach defense divisions were impressed Russian prisoners of war. Do you mean during D-Day? A few years ago I visited the British military cemetery at Lyness on Orkney (linked to the Scapa Flow naval base). It’s mostly naval personnel and marines, but also some German sailors and soldiers. It’s a sombre place, enhanced (if that’s the right word) by its bleak moorland location. One thing that struck me (and would have brought tears to my eyes had I not been in company and maintained a stupid stiff upper lip) was how young the WWI sailors were. IIRC there were whole rows of teenagers. In the words of Kate Bush’s Army Dreamers: “But he never even made it to his twenties”. David Benson reminded me about this man’s story, which I read years ago. 9th April was a successful day for the Japanese. They sank the aircraft-carrier HMS Hermes on the same day off Sri Lanka, with the loss of over 300 British lives. They planes came from the same Japanese task force of 6 carriers, led by Admiral Nagumo, who also led the Pearl Harbour task force. Nagumo achieved total success, forcing the Royal Navy to retreat to East Africa. Many of the same Japanese carriers bombed Darwin, Australia. It was the period of the war when Japan was able to “go mad” for 6 months, between Pearl Harbour (Dec, 1941) the Battle of Midway (June 1942). The British position in the east never recovered and it was really the end of Britain’s Asian Empire. That is the context of the events your grandfather was thrust into. He, and many others, had the misfortune to live in “interesting times”. One of my Dad’s buddies in his Iwo Jima platoon lost his brother during that period: lost at seas, presumed dead. He was a Marine on the USS Houston, which was sunk during the Battle at Sunda Strait. They did not learn until the end of the war that he had survived. As a POW he worked on the railroad bridge on the Kwai River. Near the end of the war he was moved to Vietnam. From there most off the POWs were loaded on ships to be sent back to Japan. Many of the POW ships were sunk by the US Navy. He was fortunate. When the war ended he was still held in Vietnam, which is where he was freed. Thanks, I hadn’t realised all of that. Thanks, I didn’t know about the memorial. I shall have to try and visit. Something I meant to add to the post is that after talking with my Mother again, it turns out after my grandfather was freed, he ended up in Durban (which, coincidentally, is where I grew up) where he signed on to a ship called the SS Sontay, which seems to have headed for Canada. He then signed off this ship in November 1941, again in Durban. He then somehow made his way back to the UK, where he signed on to the Sagaing, which was bombed a few months later. So, basically, he was sunk, became a prisoner of war, was released, immediately signed on to another ship for about 6 months, then signed off and signed on to the Sagaing, which was bombed a couple of months later. Not much of a break. This photo was taken during repair at the dry dock in Washington. That is basically where the bow separated. Almost 200 sailors died instantly. Repair? They actually repaired that damage and sailed again? Yes. 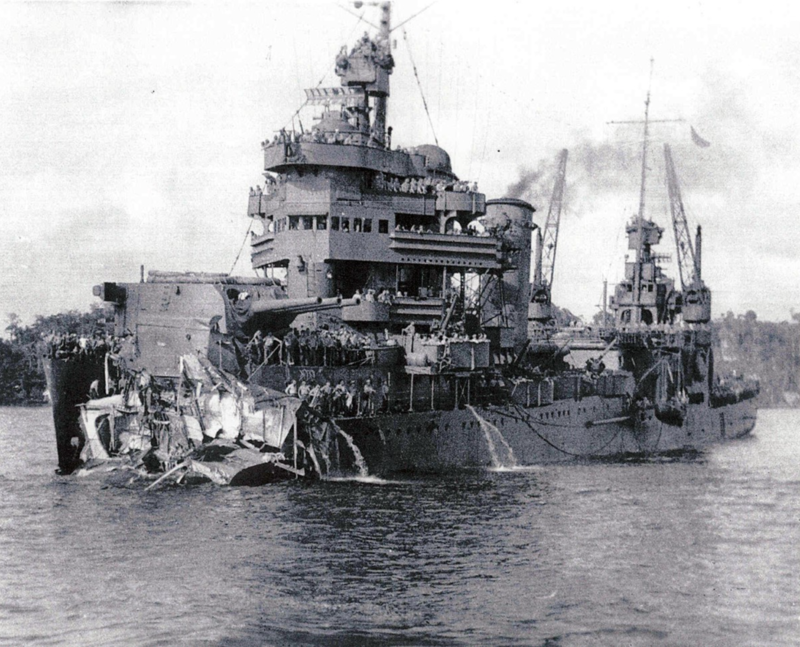 Torpedoed on November 30, 1942; back in commission in July, 1943. The NO boat ended up with around 17 WW2 battle stars. I’m the grandson of the Sagaing’s final master, Captain Samuel Sinclair Duncan, and the current Wiki page on the Sagaing connects to a rather florid description of its sinking with a captain called O’Hara. My grandfather was commended on 27 October 1942 as the master of the Sagaing. Both versions can’t be true. Any ideas? BTW, I’d very much like to see bigger images of the ship on fire. I think I may have seen some tweets that were from you, and I was going to send this post to you, but then couldn’t find the tweets again (maybe they weren’t from you, though). I don’t have specific ideas about resolving the issue as to who was the Captain. My mother has her father’s log book, and maybe his diary, so maybe it says something there. She also has originals of the photographs, so I’ll see if she can scan them at a higher resolution. I’ll try to let you know what I find out. That would be excellent, thanks very much. I don’t have any doubt as to who was the master, but it’s interesting that another version has appeared. As an author and previously a copywriter, the writing on the other account strikes me as unconvincing. In addition to consequences of the rude behaviour of the Japanese in 1942, my grandfather was torpedoed and sunk off Ireland in WWI, and survived the Murmansk convoys, so it’s remarkable that I even exist. Sadly he died while I was still too young to know I should ask for his stories. The story about O’Hara as Captain of the Sagaing is rather bizarre. And, as you mention, your grandfather was given a Merchant Navy Award as Master of the Sagaing. In the US Merchant Marine this type of information might be recorded in the sailor’s personal service record, which can be ordered here from the US Coast Guard. I’ve never read one. The US Navy service records are very detailed. They learned to be a navy from the British navy, so maybe there are similar records there. My Dad’s includes the surgeon’s drawing of the multiple places he was wounded. All schools, transfers, promotions, etc. are dated. The passenger ship Sagaing was at anchor in Trincomalee on April 9, 1942 when Japanese aircraft attacked the port with bombers. The Sagaing was struck by two bombs, one on the fore deck and the other on No. 4 hatch and took fire at once. Steam pipes had been fractured in the engine room which considerably reduced pressure on the hoses, while the tug Samson, which came to her assistance, had also been badly damaged. Every effort was made to save the ship, Officers jettisoning ammunition, but the fire gained and the vessel took a heavy list to port. The Master, Captain S. S. Duncan, had no alternative but to give orders to abandon ship. 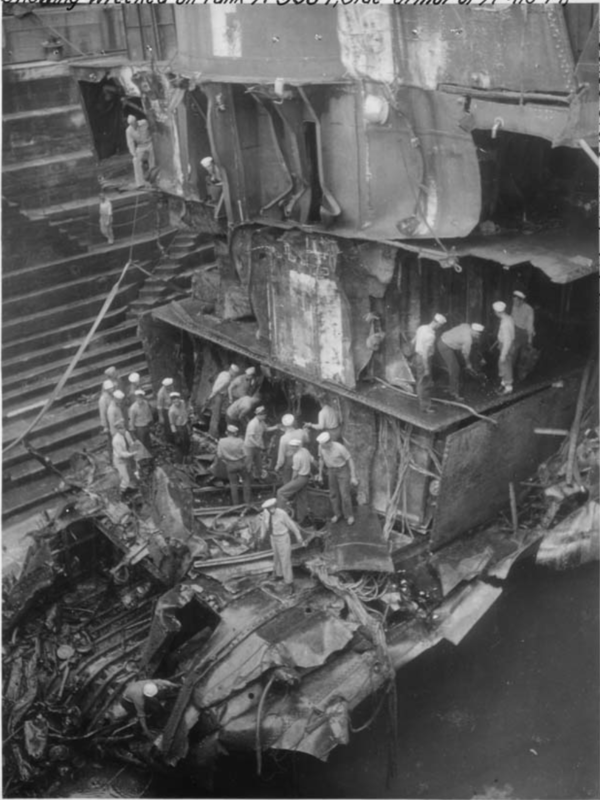 The cables were slipped to enable her to beach herself at Malay Cove, and later shells were fired into her hull below the waterline to sink her and save some of the non-perishable cargo. Unfortunately she proved a Constructive Total Loss , although some of the cargo was salved. Here’s the page in the London Gazette that mentions the commendations. It has Samuel Sinclair Duncan as Master, but lists John Scott Robinson Grassick as the extra 2nd Officer, rather than as the 3rd Officer.